Someone once told me I shouldn't call the special outings with my kids a date ... but meh I disagree. To me a date is when you take away any distractions and focus on the person you are with - talking, spending time with them and getting to know how they tick. I can't see anything wrong with calling it that as it is exactly what I am doing when I am spending one on one time with my kids. Once a month we like to spend some special one on one time with each of the kids. We do different things each time. Sometimes it might be a movie or a long walk on the beach. Other times we go out to lunch or dinner or just a simple milkshake date. It doesn't matter what we are doing, they don't really mind. They just really get a kick out of spending some alone time with me or Carl where they do not have to fight to be heard or to get our attention. That's the problem I guess when you have more than one child, you need to spread the love around and often someone feels like they just don't get enough of it. I know when one of my kids is feeling like they aren't getting enough attention as they tend to start acting like a little turd. You know any attention is good attention and all that. I asked my youngest the other day in the car on the way to the movies for our special time, why he likes date day so much? He looked at me and smiled the sweetest smile ever and said "because it makes me feel special". SOLD to the kid with the long eyelashes and gappy smile. That is exactly how I want them to feel because they are special and I want them to know it. I do expect that they act like little gentlemen when we are out together, you know just good manners, engage with me and be respectful etc. Their future wives will thank me for that I hope, or at the very least name their first born daughter after me... jokes. I'll just be happy with them letting me spoil the babies. I asked my boys for their Top 10 list of favourite things to do on our dates and I thought I would share it with you in case it gives you any ideas for things you haven't yet tried with your own kids. 1. Sushi Train. Yep of course they do because they can eat eat and eat. Just a word up though, if you have kids with bottomless pits for stomachs then maybe consider giving them a carby snack before you go or you could be up for a bit of moolah. 2. Beach Scavenging. Take a basket or a bucket and go searching for drift wood and cuttle fish and beach glass - all of which you can later use for some crafting. 3. Milkshake Date: A little cafe where you can people watch whilst you drink your shakes and together create imaginative stories about the people that pass you by. 4: Movies: You get bonus points for this if you stay awake through the whole movie. 5: A Photography Outing: Arm yourself and your date with a camera and head out to photograph each other being silly in a new surrounding. You may just discover you have a budding photographer on your hands. 6. A Picnic Dinner: Pack up your dinner for two and a blanket and go somewhere and eat your dinner together under the stars. 7. A Play At The Park: The catch is you have to go on everything with them - swings, slippery dips, roundabouts etc. The more of a goof you act, the better. 8. Shoot Some Hoops: Head to your closet basketball court and shoot some hoops with your favourite little homie. 9. Get Crafty: Many shopping centres have little craft activities you can join in the holidays or there are usually arts and crafts courses at your local community centre you can visit casually. 10. Ice cream and a Walk and Talk: Go to a suburb that you don't know that well, find an ice cream shop and treat yourself. Then go for a wander whilst you eat and have a chat about life or anything else they fancy talking about. You will be surprised what they want to talk about when it is just you and them and no other big ears listening in. 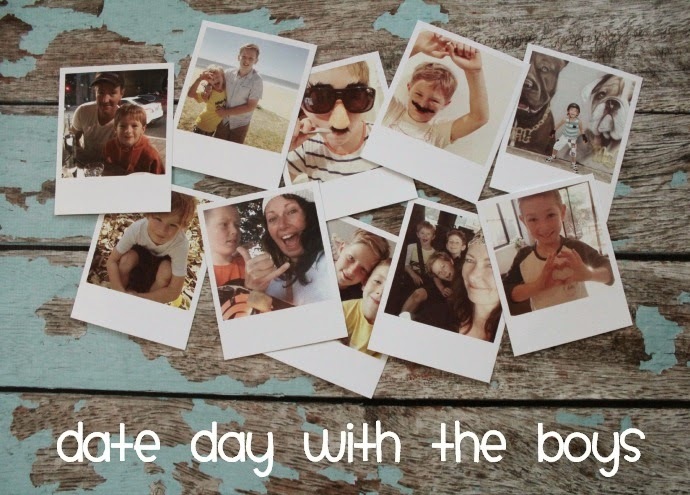 Do you do date day with your kids?